This sweet potato chili will become a meatless Monday dinner staple in no time. The heartiness of the sweet potatoes, beans and veggies will make any carnivore forget all about the lack of meat in the first place. 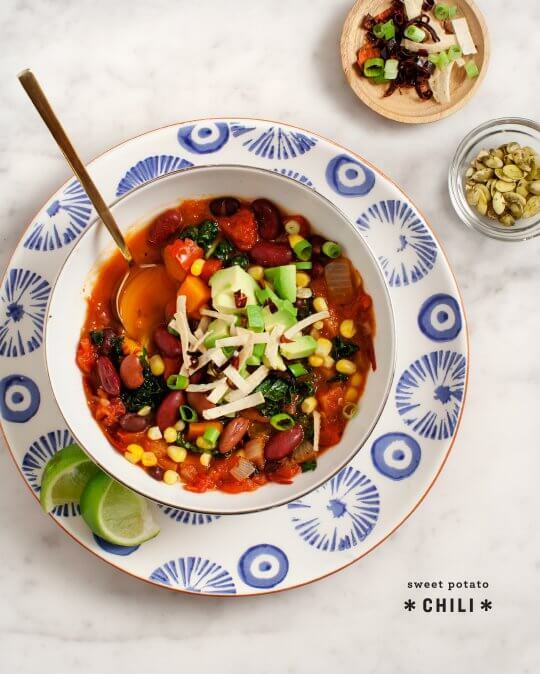 The tangy lime finish zests up this vegetarian delight, creating a southwestern flair that will surely satisfy any veggie or meat lover. Sweet potato chili is perfect as a stand-alone meal, topped (or smothered) with cheese, and garnished with chopped green onions, cilantro, or avocado. Add chili powder, 1/2 the sliced chiles, and stir. Cook until fragrant (about 30 seconds), then add the vinegar, followed by the tomatoes. Stir, then add the broth and the sweet potato cubes and beans.